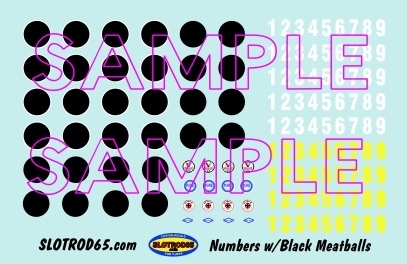 SLOTROD65 is proud to offer numbers, stripes and 'meatballs' (colored background circles) sized specifically for T-jets. These decals allow the modeler to transform any slot car into an eye popping racer! 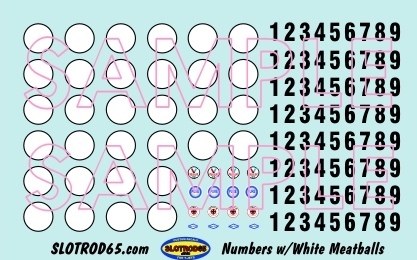 The two numbers sets give the modeler a choice of white or black background circles. Each of these three sets includesclassic sponsor decals. T-jet decaled with an assortment of stripes, numbers and sponsors. These three decal sets offer the modeler a wide variety of options. Half of the white background circles have a black outline, the rest are plain white. Likewise, half of he black background circles havd a white outline, the rest do not. 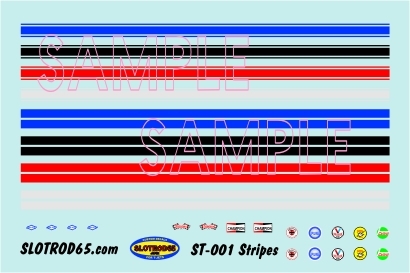 The stripes set has two different styles of stripes in red, white, blue and black. Each decal set (black numbers with white meatballs, white numbers with black meatballs, ans stripes) are sold seperately. Please see below for samples of the actual decal sheets. Please note that the actual decals are far sharper than the below sample scans.